Miss Myrtle Woldson knew exactly what she liked. She liked early-20th-century French furniture, and she liked it arranged perfectly. She liked silver. Not just serving utensils, but candelabra and other items. And she kept a toothbrush and silver polish handy in every room so she could do a little scrubbing here and there as she moved about her home. She liked order and precision. Kitchen cabinets were labeled and every pot and pan had its own place. In her gardens, flowers were arranged in perfectly measured lines. She liked geraniums. Apple blossom pink geraniums, to be specific. She liked classical music and art and going to productions at the Spokane Opera House. She liked Lincoln Continentals which she drove on long road-trips as well as short drives around her neighborhood to keep an eye on things. She liked the view from her grand home on Sumner Avenue, which overlooks downtown and the Spokane River. And she really liked the gleaming copper roof atop the Jundt Art Museum at Gonzaga University and its place in her panoramic view. And speaking of Gonzaga, she liked Bulldog basketball enough to have cable run to her favorite third-floor sitting room so she’d never miss a game. Myrtle Woldson was born in Spokane in 1910 to Martin and Edwidge Woldson, her father an emigrant from Norway, her mother the child of a large French family in Montana. From her mother, Myrtle learned the life of a true lady. She and her sister Frances participated in all the high-society events of the 1920s and ’30s in Spokane — parties at The Davenport Hotel, The Spokane Club, the Women’s Club and other settings well known for their glamour and gossip. The Woldson home played host for many teas, receptions and parties — to celebrate the girls’ visits from college in San Francisco, and to commemorate the holidays. The Spokane Chronicle reported on every event with lavish detail: what the Woldson women wore, how the home was decorated, what was served for dinner. An introvert by nature, Myrtle did not particularly enjoy the social gatherings. To her they were perfunctory, whereas Frances rather enjoyed them and was frequently adored in the papers for her charm and beauty. When Frances married and started a family, Miss Woldson remained at home with her parents. She and her mother created world-class French-inspired gardens and enjoyed participating in Spokane Garden Club activities. By the time Martin died in 1958, Miss Woldson (as Myrtle wanted to be called) was putting into practice all the business sense she had witnessed. She purchased land in Spokane (Havermale Island in Riverfront Park, which soon became the centerpiece for Expo ’74) and later moved her interests to Seattle where she purchased three parcels of land in the waterfront district. For decades, she earned thousands of dollars each month from her investment in parking lots — properties that held special interest for the city of Seattle, and one of which was the focal point of a legal battle. Miss Woldson ultimately prevailed. Over five decades of buying and selling properties, Miss Woldson had quietly developed her own multi-million dollar enterprise. She was cautious of people and organizations seeking financial gifts, she sued when it appeared wrongs needed righting (which happened with neighbors and corporations alike), and she remained ever watchful, ever thoughtful about where she might leave her fortune someday. Miss Woldson watched, too, what friends were doing with their own fortunes; she saw buildings emerge with family names emblazoned on bricks. She consulted with them, hired attorneys, wrote wills (multiple versions), and quietly but methodically developed her plan. In Seattle, people speculated that upon her passing, Miss Woldson’s property on the waterfront would be sold, and could finally be captured for the city’s long-term revitalization plans. In Spokane, Miss Woldson had already given $1.2 million to the development of gardens in honor of her mother (Edwidge Woldson Park, just below her home on Cliff Drive) and $3 million in honor of her father (Martin Woldson Theater at the Fox). She had also supported the Northwest Museum of Arts and Culture, Spokane Humane Society, Catholic Charities, Conrad Mansion in Kalispell, Montana, and other organizations. In November 2012, Miss Woldson called the president of Gonzaga, Thayne McCulloh, and asked him to visit at her home. There, after lengthy conversation filled with humor and great understanding of current news, she began to ask probing questions about the future of the University. And so began a new chapter in Gonzaga’s relationship with this remarkable woman. After her passing in April 2014, Miss Woldson’s will revealed several recipients of her estate: these included her former gardeners, a dearly beloved neighbor and two cousins, as well as Catholic Charities, which would receive $1 million to expand care to Spokane’s homeless population. But that wasn’t all Miss Woldson had in store. For the last several years of her life, Miss Woldson’s goal was to determine where her estate would be appreciated and do the most good. 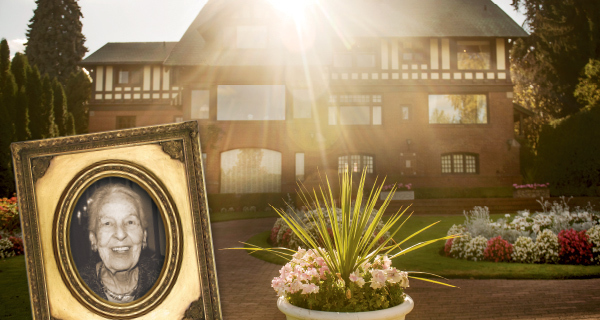 To the surprise of all who had been watching her and the growth of her empire, the remainder of her investments, the waterfront property in Seattle, and her home on Sumner Avenue (including all of its contents) culminated in a $55 million gift to none other than Gonzaga University. Besides the performing arts center she had discussed previously with the president, she wanted to start an endowment to provide scholarships to generations of students who otherwise might not have a Gonzaga education. Oh yes … among all those things Miss Woldson knew she liked? The geraniums, the silver, the order and precision? Best of all, she delighted the element of surprise. And in her final breath of life, she gave it. Thanks to Miss Myrtle E. Woldson’s great generosity, Gonzaga University and the entire Spokane community will benefit from a new performing arts center. Named in her honor, the arts center will cost approximately $30 million and is expected to open in fall 2018. Additionally, hundreds of students will benefit in a deeply personal way, as their education is supported by scholarships from what will become a $25 million endowment, also made possible by Miss Woldson. Miss Woldson was a proud Zag who attended University events, performances and loved to cheer on the Bulldogs at basketball games. She made generous gifts to the Jundt Art Museum Endowment, athletics and student scholarships over the years. “Miss Woldson’s legacy will live forever at Gonzaga University and through future generations of our students. A true friend and giant of philanthropy, her quiet, private generosity to Gonzaga, the city of Spokane and so many causes in our region over time is but one of the great expressions of her legacy of love,” President McCulloh said. *apart from the cummulative value of gifts given by the Society of Jesus. A 104-year life is not without great stories. In learning about Miss Woldson, we’ve uncovered some doozies: experiences she had in a very strict all-girls’ school run by French nuns, tales of travels, a love affair with The Davenport Hotel, the boxes of chocolates she sent to a neighbor boy every year on his birthday. This very proper woman, who met with people in her formal sitting room off the main entrance, who always had a polished presence, once answered the door at 10 p.m. in her nightdress and invited policemen in for a two-hour conversation and a midnight snack. We have those stories and many more coming your way. Miss Woldson’s legacy to Spokane, through her gracious donations to Gonzaga University and her establishment of the Myrtle Woldson Institute at the House of Charity — AND the restoration of the iconic Fox Theater — implores us to look a little further into the mystery that was Miss Myrtle Woldson. Coming in 2018, with the opening of the Myrtle Woldson Performing Arts Center, we’ll share a detailed history of the woman behind these gifts.